Truth be told, the bag in the pic to the left is just about empty. I blew air into it and resealed it quickly to make it look full-ish. Did I fool you? I simply forgot to take a picture before I ate most of the bag. Silly me. 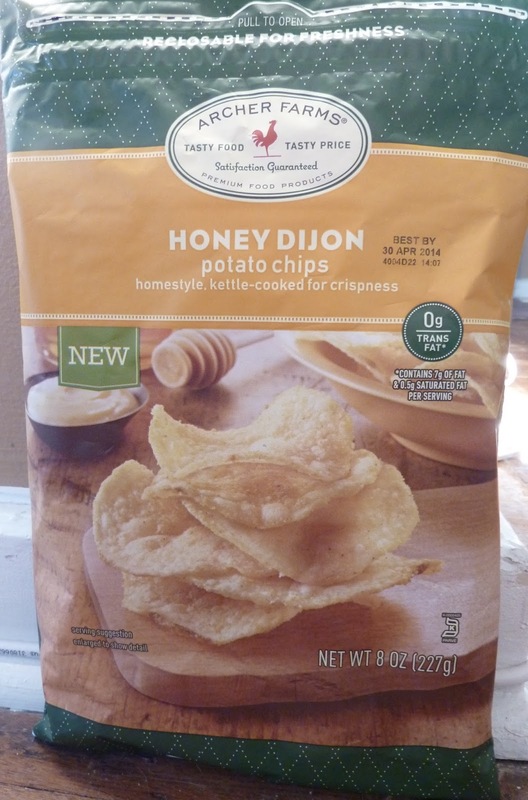 These chips are a pretty decent approximation of Kettle Chips' Honey Dijon flavor. I've always been a huge fan of the Kettle Chips version. They're quite possibly my favorite potato chips of all time. Archer Farms' offering isn't too far behind. Chips are just a bit more syrupy. There's like an actual glaze of honey and mustard or something. The Archer Farms chips were coated and glazed as well, but perhaps with a bit less of the honey mustard. But at $2.99 a bag, I'm not complaining. The differences between the two types of chips are subtle and hardly noticeable. Plus, Archer Farms version has the resealable bag, just in case you aren't gluttonous enough to eat the whole thing in one sitting. You'll be tempted to, but if I can resist the urge, I'm sure you can, too. My wife liked these as well. If you're a fan of the Kettle Chips, AF brand is well worth a purchase, IMHO. I think this product is worthy of 9 out of 10 stars.